Diced lamb with pieces of halloumi cheese and olives. Allow 2 kebabs per person. 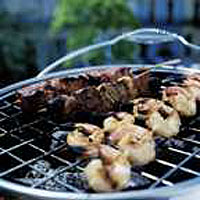 Cook on a preheated barbecue or under a preheated grill for 10-15 minutes, turning occasionally. The halloumi cheese will melt a little and turn golden brown as the kebab cooks. Mix together a 410g can Waitrose Chick Peas, drained, 1/2 small red onion, finely chopped, 1/2 red pepper, diced, a chunk of cucumber, finely diced, and a handful of chopped mint. Stir in 6tbsp Waitrose Garlic & Herb Low Fat Dressing. Serve in warm split pitta breads with Waitrose Houmous.